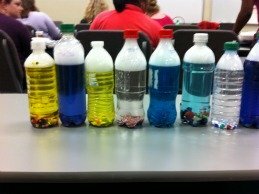 Below are some examples of the Grief Therapy Bottles made in a graduate counseling class at Mercer University. The graduate students made several colors based on their own personal feelings presented at the time. Show your clients who are suffering with grief and loss that grief and loss feelings come and go like waves in the ocean. All you need is a recycled plastic water bottle with lid, tap water, food coloring, assorted sequins in different shapes, and glitter. This grief and loss therapy technique can also be used for all feelings in general. I call it a "Feelings Bottle" when I use it for sadness, anger, fear, etc. 1. Process with your grief therapy client and discuss the wave(s) of emotions being felt within the body (grief, stress, anger, etc.). Identify the color felt and the meaning behind it. For example if grief is experienced it may be a blue color, anger might be red in color. 2. 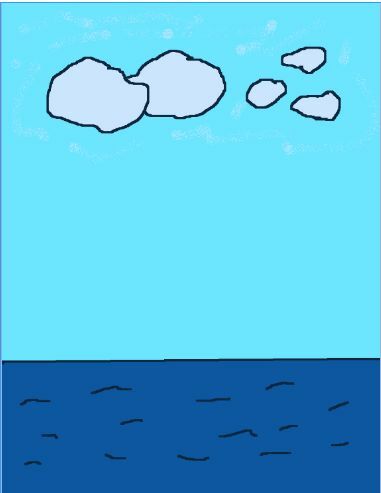 Ask the grief therapy client to draw what their grief waves would look like if the waves were in the ocean. Use the sheet below. 3. Explain to your grief therapy client that grief and loss emotional waves come and go and it is similar to the ocean. Talk about how the ocean can be stormy and have strong waves. But most of the time the ocean settles down and the waves are calm again. Have the grief therapy client draw a time line of the waves in their life below. 4. Make a Grief Therapy Bottle to demonstrate this. Fill the bottle up halfway with water. Add dish soap, food coloring of choice, and glitter or waterproof objects (client’s choice). Glue the top on to the bottle to keep it from spilling. 5. Shake the Grief Therapy Bottle up and show how the grief waves are turbulent. Then come back to the bottle after a few minutes and see how calm the water is. 6. The grief therapy client can take the Grief Therapy Bottle home as a reminder that emotional waves come and go similar, to the water in the bottle. Grief & Loss Wave Therapy Technique Work Sheet: Using the ocean sheet below draw a time line of waves that are stormy to represent grief in your life. 1. How long did these grief waves last in your life? 2. Did you ever experience calming waters? How long did they last?